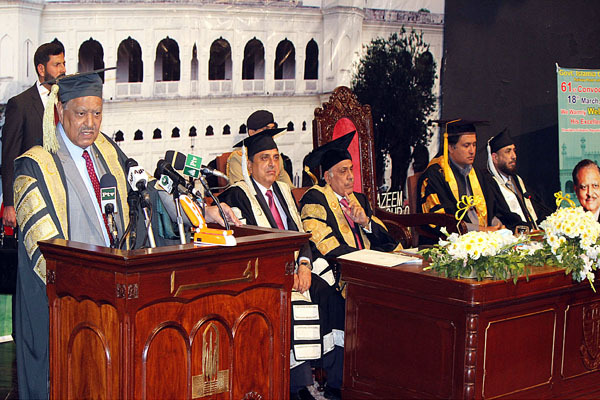 LAHORE, March 18 (APP): President Mamnoon Hussain Saturday advised the youth to focus on acquiring higher education particularly in science, technology and Information technology to contribute to country’s progress. (GIC) Railway Road here at Alhamra Hall on Saturday. Governor Punjab Muhammad Rafique Rajwana, Provincial Minister for Higher Education Syed Raza Ali Gilani, Vice Chancellor of Punjab University and GIC Principal Professor Tahir Javed were also present. He said as Islamia College was completing 125 years of its existence there was a need to promote legacy and traditions of our predecessors. Mamnoon Hussain said that youth were the precious asset of the nation who must play their role against corruption that impeded the country’s growth. and they must focus on contributing to its development, he added. that would change the fate of the region, as it would generate employment opportunities and expedite business activities. Completion of the CPEC would usher in progress and prosperity not only in Pakistan but also in the entire region,he maintained. around country’s economy, which was also being acknowledged by the international financial institutions. He stated that a number of projects of energy generation, infrastructural and industrial development had been started and called upon the people belonging to every walk of life to support the government in completion of these projects. route, asserting that negative propaganda in this regard was unjustified and people should reject it. The government, he said, was committed to ensure equal development in all the sectors including education, health,infrastructure and transport. and economic situation, the nation needed to produce such personalities, who render their services in various fields for development and stability of the motherland. when these institutions turn into Centre of Excellence for promotion of knowledge. students and faculty members to uphold prestige and dignity of this eminent seat of learning to take forward the legacy and teachings of Quaid-i-Azam. hoped that they, in their practical life, would continue to work for the betterment of Pakistan. On this occasion, the President gave away medals to the position holders of various disciplines. The GIC Principal also presented a shield to the President as memento to the event.